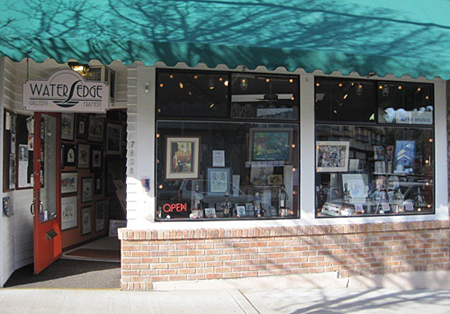 Waters Edge Gallery in downtown Gig Harbor, Washington, welcomes you to our unique art gallery. Whether you are a Gig Harbor local, or visiting our wonderful waterfront, be sure to stop at Waters Edge Gallery to view our carefully selected array of artwork, posters and more. Need something framed? 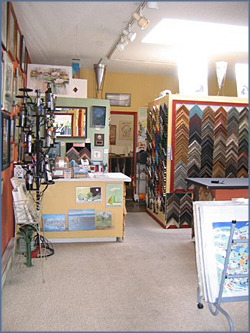 Make Waters Edge Gallery your custom framing shop for anything from priceless paintings to family photos to mirrors. We carry a huge selection of frames in a rainbow of colors, styles and materials, and we always take extra care of your item. Click Here to see samples of the artists we carry. We carry a wonderful selection of inexpensive gifts such as note cards, refrigerator magnets and other items that would make the perfect souvenir of your visit to our town. Stop by while you are downtown and say hello! custom sized art works for your decor. Recognized by Sunset Magazine as one of the best Art Walks in the Northwest, the Gig Harbor Art Walk takes place the FIRST SATURDAY of every month from 10am-5pm. Have fun in historic downtown Gig Harbor. Pick up an artwalk passport at Waters Edge Gallery and be eligible for a monthly drawing to win a $50 gift certificate from alternating galleries. In addition to quality originals, prints and posters, we represent 20 local artists in a variety of media -- watercolor, oil, pastel, photography, collage, paper sculpture, stained glass and pottery. We also carry prints and posters from nationally recognized artists. Art catalogs are available for you to browse and order from.